the canDIshhh tales: Thank you, Nora Daza! I was startled when I saw a friend's status message on FB that said RIP Nora Daza. I've always said that it was because of the show Cooking it Up with Nora - that I learned to appreciate watching a cooking show. Nora Daza is an icon for me. She's one of the biggest influences in my life with regards to cooking. I would remember waking up early on weekends to watch her cooking showwas it Saturday or was it Sunday morning) on Channel 2 when I was still a kid. Watching her show made me want to try cooking. I think it was because of watching the show that I learned to love to cook and bake. I would remember her and her children (I remember Nina and Sandy) whip up dishes and I was so fascinated with how they sauteed and cook up dishes with such ease. The theme song is still plays in my head when I remember her. So, to Nora Daza - THANK YOU for your cooking show. If not for your shows, I wouldn't like to be influenced to learn how to cook (and bake). Thank you for touching my life in that good way. Thank you for your show. 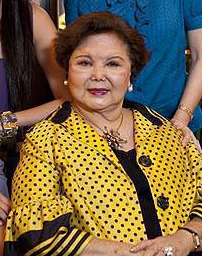 Rest in Peace Ms. Nora Daza!